Light Reconnaisance Armored Car le.Sp. Railroads are one of the primary war time movers of men and materiel for over 100 years. Protecting them is vital if an army wishes to maintain an efficient and secure supply line. 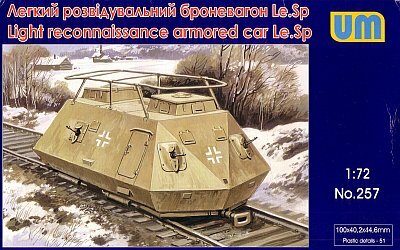 In 1943 the Germans started work on two versions of motor driven railcars (aka draisines) for reconnaissance and protection duties - a small lightly armoured version (leichte Schienenpanzer - le.Sp.) and a heavier armoured version (schwere Schienenpanzer - s.SP.). 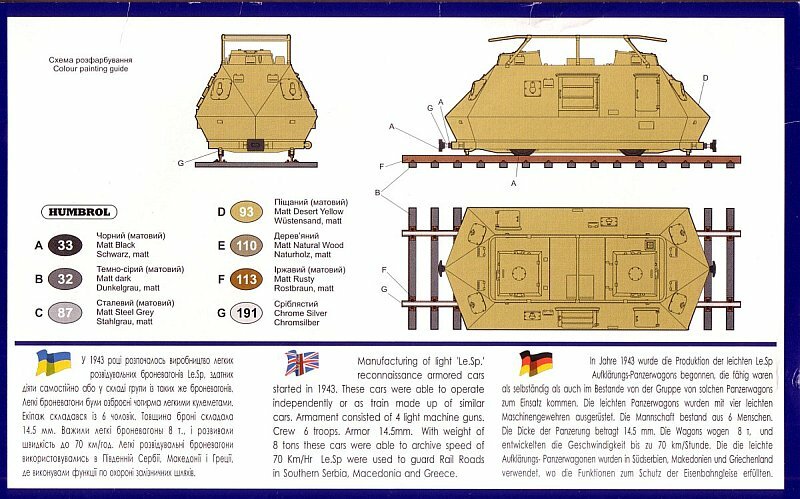 These would be independent vehicles, each with their own motor to allow them to travel singly, hooked together in sub-groups, or as a complete train, allowing operational flexibility and the ability to continue the mission should one of the cars become damaged. Steyr was the designer for both versions. 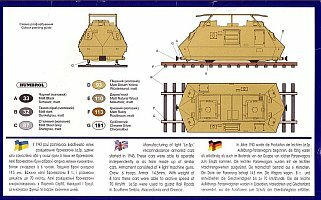 The leichte Schienenpanzer had armour of 14.5mm. The hull had sloped sides, with doors on both sides and covered air intakes on one side. There were two hatches on the roof, one at each end. The vehicle had no fixed weapons. The hull had 6 MG ports - two at each end and one per side. Also included was a bed frame style aerial for radio communications. The light weight gave a top sped of about 70kph with a Steyr 76hp air-cooled engine. Driving stations on both ends of the vehicle allowed it to be driven easily in either direction on the rails. 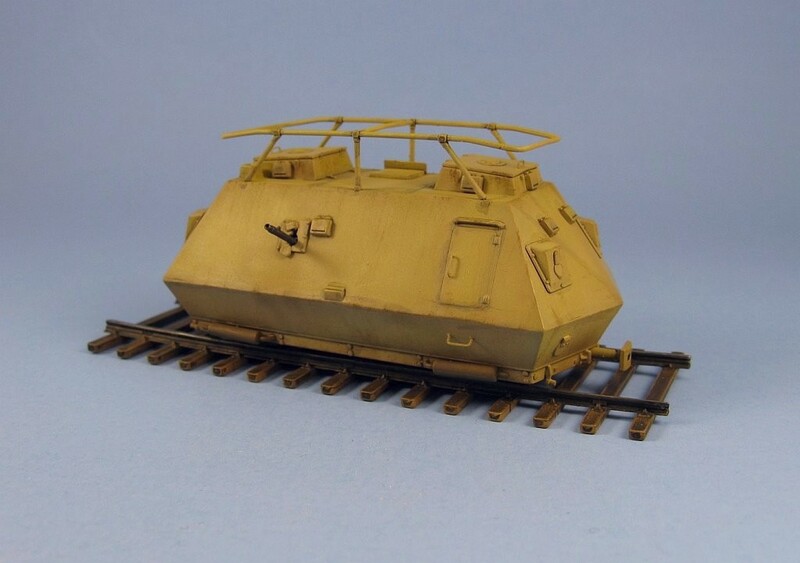 Approximately 40 were built and the first were available in the spring of 1944 for anti-partisan operations in the Balkans, where due to its light weight it could operate on tracks that couldn't support heavier trains. Parts are molded in UM's typical soft, light grey plastic. Flash is minimal and for the most part the molding is well done. There a few spots to look out for where the plastic has some low spots and requires some filling: at both ends of the upper body (part B1) and on the square hatch molded on the hull top (where part B7 attaches to in Step 6). A nice touch is the molding of the upper and lower hulls as one piece units. 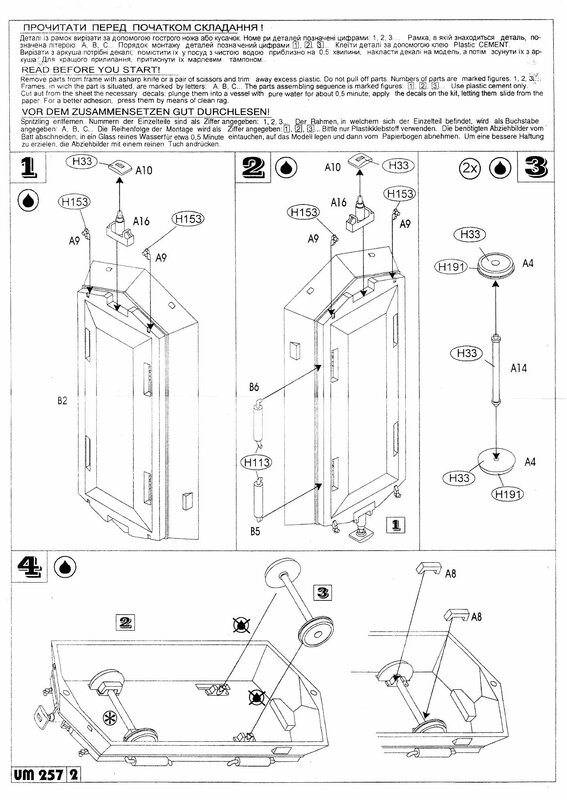 This removes any chance of alignment problems that you usually get with multi-panel assemblies. For this review, I'll use the instruction sheet as a guide and alter the suggested build sequence to make the construction more sensible. Here is the real starting point as far as I'm concerned. Not a lot of work needs to be done here. The wheels have three sprue attachment points that normally should be trimmed and sanded but I only fixed one as the remaining nubs will be completely inside the body and out of sight. Compared to UM's Soviet draisines the axles in this kit are much sturdier, being nice and thick, and difficult to break. Again I didn't bother removing the plastic sprue nub from the axle as it too will be out of sight when the hull parts are joined. Just make sure to align and glue the wheels onto the axle so that each wheel has the section where there were no attachment nubs be the part that will be visible outside the lower hull. This is the next logical step. Here you put together the rails. All of the UM German draisines (this kit along with UM 255 & 256) share the same rail sprue. All I can say is that whoever designed the tracks as three piece items must have been on hallucinogens at the time. 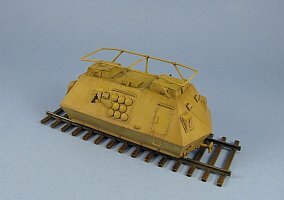 Unlike the rails found in the UM Soviet draisine kits, which are beautiful one piece units, these rails come as a base piece containing the bottom half of the rail attached to the ties, and two separate pieces for top half of the left and right rails, resulting in a split in the middle down their entire length. Needless to say this makes for a very dicey proposition gluing the top part of the rail to the bottom part, while maintaining the correct gauge for the wheels. Be warned - if you get the gauge wrong the vehicle will not sit on the rails properly! Trust me on this as my first attempt was an utter failure. With some experimentation I found the best approach to the problem was to first glue the wheels to the axles (this is why I suggest the build should start with Step 3) so they can be used as a spacer between the rails to ensure the proper distance between them as they dry. To attach the upper part of the rails to the lower half on the ties, first glue the end points, then glue the remainder of the length between the ends. I strongly suggest using a fast acting liquid glue for this, such as Tenax 7 or methylene chloride (MEK). And be very careful, because until all the parts are attached and set, the rail is quite flimsy and easy to bend or break. After everything has dried, then you trim and sand off the sprue attachment points, and while you're at it add some grain to the featureless wood ties by scraping them with the tip of a hobby knife. There are a couple of oddly placed reliefs on the tracks that siamese with the rails. These should be removed. Once the wheels/axle assemblies are no longer needed for gauging the width of the tracks they can be added to the lower hull. There are a few items to watch for at this point. First the axles are not exactly round, so if you want to have them moveable as suggested by the instructions, you will need to find better replacements and also do something with the axle caps (part A8) which also don't fit as suggested. Whether you decide to have the wheels move, or not (which is probably the best choice), you will still need to widen the holes in the lower hull where they are to fit through. These are much too narrow and need to be widened. These steps can be followed pretty much as directed. Thin part B7 (in Step 6). The upper hull hatch covers (part A18) need some work to get a more flush fit. The undersides of the covers were sanded down to thin them and then some filing was done on the indent that runs around the perimeter. 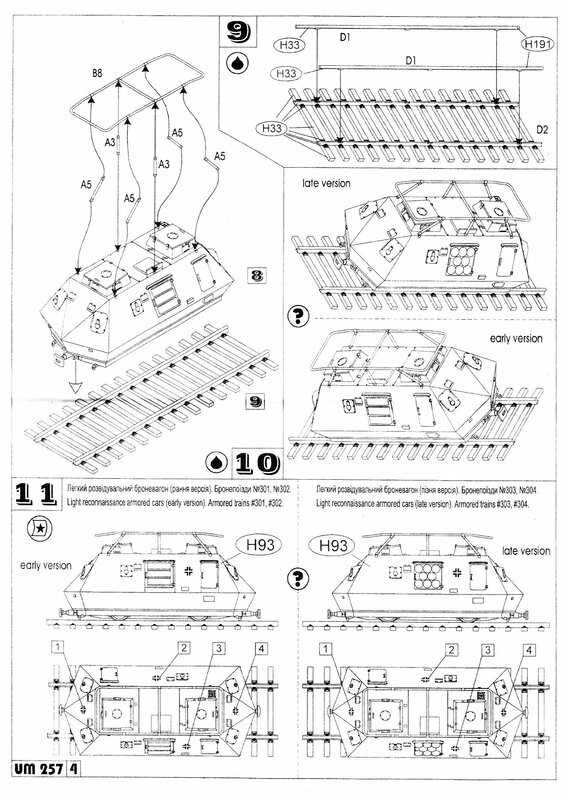 Parts are provided to build one of two versions, differentiated by the engine covers and gun ports. 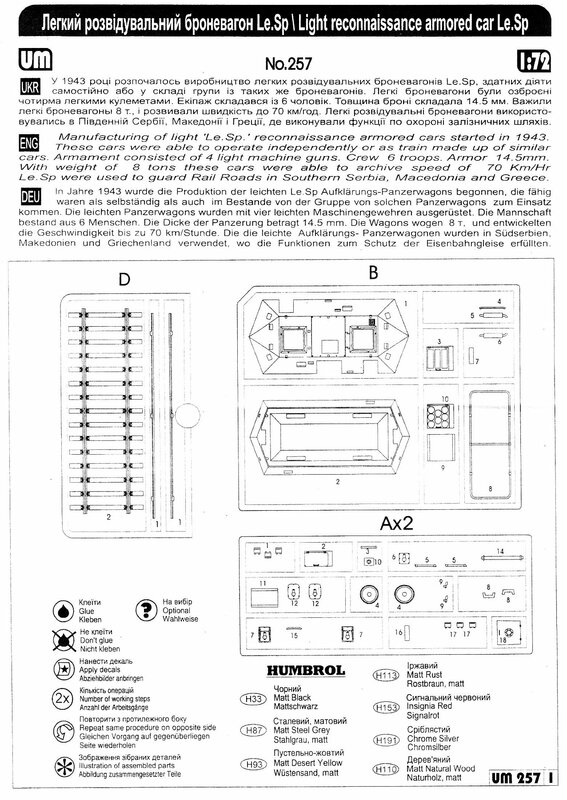 The early version uses part B3 for the engine cover and parts B12 for the gun ports. The late version uses part B10 for the engine cover and parts A7 for the gun ports. I chose to do the late version primarily because the gun ports were molded better. The early gun ports were marred by prominent sink holes that would be next to impossible to fix without totally destroying the detail. The front and rear gun ports (parts A7) have a small bump on their backside that is intended to slot into a small recess in the hull, but the recess is not present. I had to trim the bumps and sand the bottom of the ports flat in order to mount them to the hull. 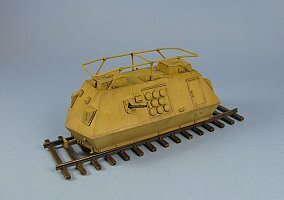 Doors come as separate pieces (part A2) as opposed to molded directly to the hull as found on the other German draisines offered by UM. Why this was done I have no idea. All the separate door parts accomplished was add more work to the build. They didn't fit flush so sanding was needed to thin them enough to remove a step that would have resulted if they were added as supplied. All of the view ports are problematic. The set that is located beside the gun ports on the lower hull are just a smidge too short lengthwise. The small indent in the hull where they mount is slightly larger than the covers so you have to decide at which end of the cover you want to add your filler. I chose the bottom side because it is straight and I could sand the filler without worrying about removing the molded on hinges. The small ports (part A17) that mount to the sides of the casemates on the top hull are either too large or the casemates are a bit too short. Either way they pretty much span the space between the hatch cover and the top of the hull which isn't what I see in my photo references. 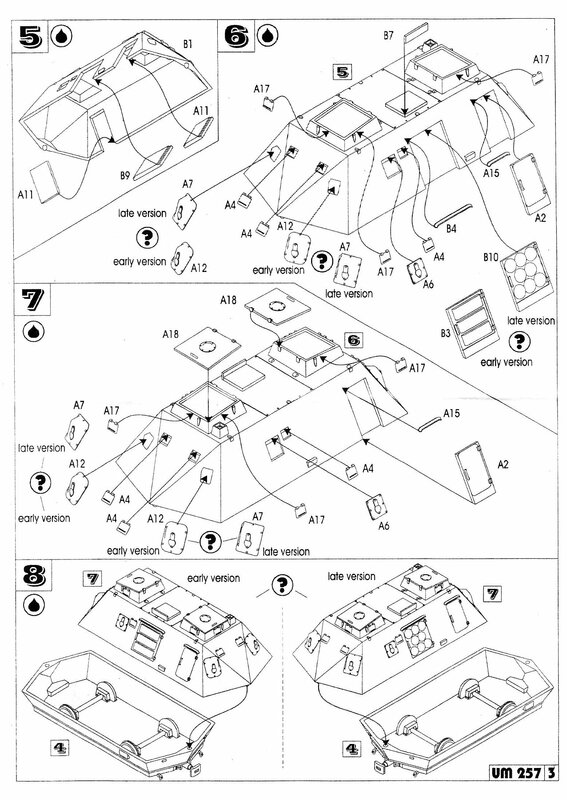 Hull vision slots are marked as part A4 in Steps 6 & 7 but they are actually part A1. A4 is the part number for the wheels. At this point I also added some missing detail. The kit has no front and rear headlight covers plus their hinges, so some round covers were punched from a sheet of plastic and hinges were excised from a kit found in the spare parts box. I added most of the missing rivets to the lower apron that runs around the perimeter of the lower hull. The exhaust pipe ends were drilled out. The two gun ports on the left and right side of the hull were opened up and new covers were made to accept a pair of MGs I planned to add later for some visual interest. Foot rungs fashioned from thin wire and added to the lower hull. After all this, the two hull halves were joined. Here the bed frame antenna is added. The antenna frame was well molded and the supports were all the correct length allowing the antenna to sit level. This step was pretty much straightforward and not very difficult at all, and once together, the frame makes for quite a strong unit. These steps were done at the end of the build to prevent breaking the plethora of small parts that you need to add to the lower hull. The bumpers are not quite correct shape wise and the depression molded in the middle is actually supposed to be a hole. I did not have any reference as to how the bumpers actually mount, versus what the kit provides, so I left this as is. Camouflage is straight forward - overall German sand yellow. I did not add any crosses as the majority of my reference pictures did not show the draisine carrying any. Various web photos (which mostly contained the same pictures as the Sawodny book above, but a few were new also).